After weeks of tireless campaigning, the big day for San Francisco mayoral candidates is finally here. Today is Election Day, and candidates will be undoubtedly as busy as the San Franciscans voting for them, as they cast their own ballots and host what we hear are some pretty sweet election parties. Candidates have spent the past week traveling around the city trying to gain as much momentum as possible before this decisive day. 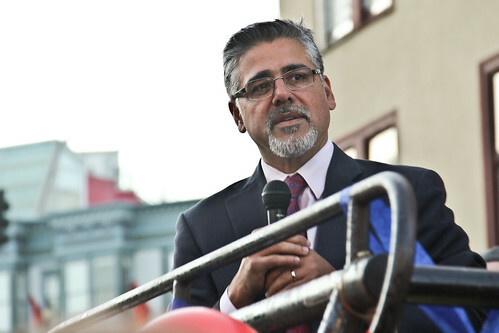 Here’s a sneak peak into the final thrilling days and hours for the San Francisco mayoral candidates. Photos updated Nov. 8. 9:45 p.m.
San Francisco mayoral candidate David Chiu, left, talks to Russian Hill resident Salvatore Leocata minutes before voting venues close Tuesday, Nov. 8, 2011. Photo by Godofredo Vasquez. San Francisco mayoral candidate David Chiu, right, talks to Joe Abbott, center, and Ross Armatici, left, 10 minutes before voting cenues close Tuesday, Nov. 8, 2011. Photo by Godofredo Vasquez. San Francisco mayoral candidate David Chiu, center, talks to Russian Hill residents minutes before voting venues close Tuesday, Nov. 8, 2011. Photo by Godofredo Vasquez. 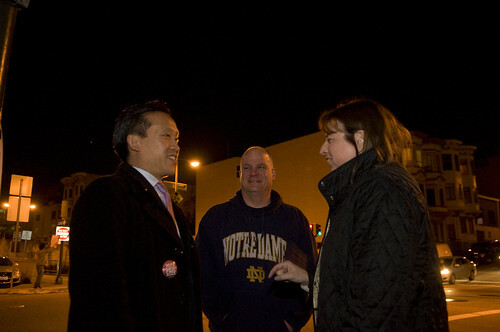 San Francisco mayoral candidate David Chiu, left, talks to Russian Hill residents minutes before voting venues close Tuesday, Nov. 8, 2011. Photo by Godofredo Vasquez. Photos updated Nov. 8. 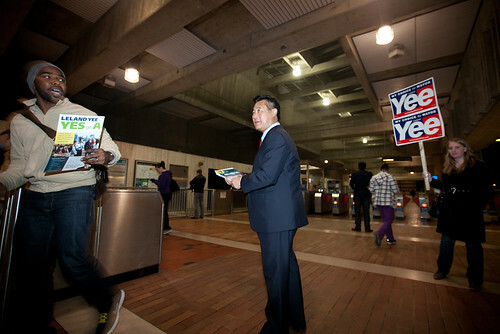 9:00 p.m.
California state Senator and SF Mayoral candidate Leland Yee (center) campaigns in the Balboa Park BART station Nov. 8, 2011. Photo by Elijah Nouvelage. 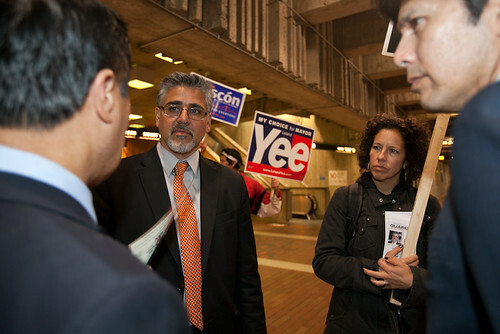 Senator and SF Mayoral candidate Leland Yee (left) talks with fellow candidate John Avalos and his wife (center) while Yee supporter and California state Senator Kevin de Leon (right) looks on in the Balboa Park BART station Nov. 8, 2011. Photo by Elijah Nouvelage. 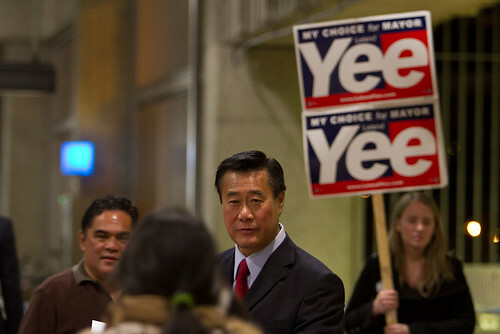 Senator and SF Mayoral candidate Leland Yee (center) campaigns in the Mission district of San Francisco Nov. 8, 2011. He was assisted in the Spanish-speaking neighborhood by Senator Kevin de Leon of Los Angeles. Photo by Elijah Nouvelage. 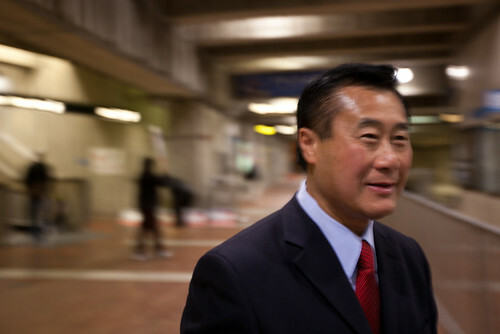 California state Senator and SF Mayoral candidate Leland Yee campaigns in the Balboa Park BART station Nov. 8, 2011. Photo by Elijah Nouvelage. 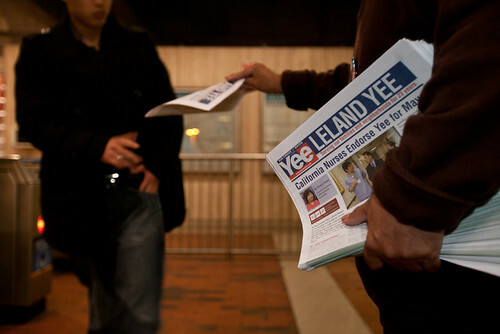 A Leland Yee supporter hands out campaign literature in the Balboa Park BART station Nov. 8, 2011. Photo by Elijah Nouvelage. Photos updated Nov. 8. 8:22 p.m.
California state Senator and SF Mayoral candidate Leland Yee (left) talks with fellow candidate John Avalos (right) in the Balboa Park BART station on November 8, 2011. Photo by Elijah Nouvelage. 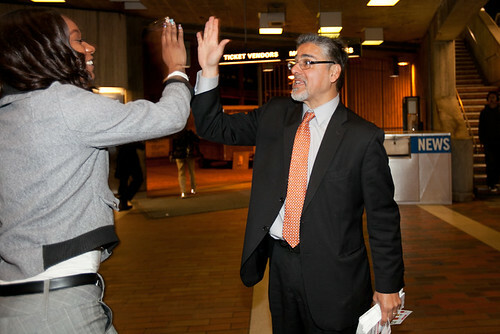 SF Mayoral candidate John Avalos high-fives a supporter in the Balboa Park BART station on November 8, 2011. Photo by Elijah Nouvelage. 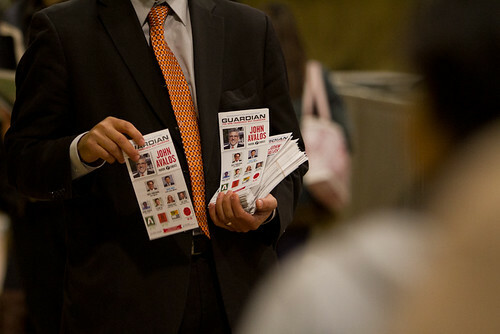 SF Mayoral candidate John Avalos hands out campaign literature in the Balboa Park BART station on November 8, 2011. Photo by Elijah Nouvelage. 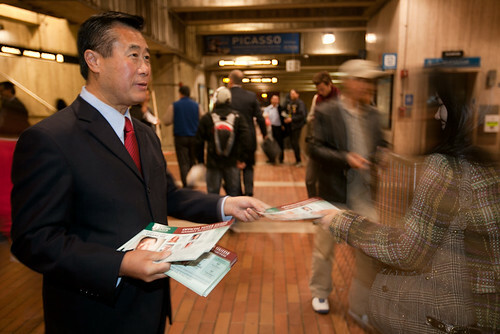 California state Senator and SF Mayoral candidate Leland Yee (left) campaigns in the Balboa Park BART station on November 8, 2011. Photo by Elijah Nouvelage. 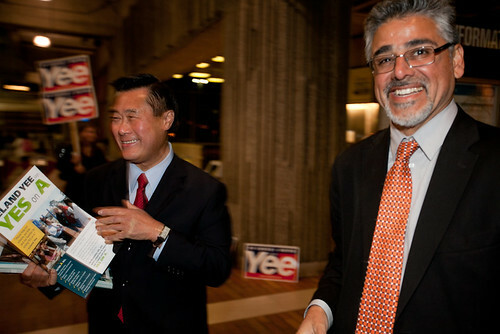 State Senator and San Francisco Mayoral candidate Leland Yee (right) campaigns in the Mission district of San Francisco on November 8, 2011. 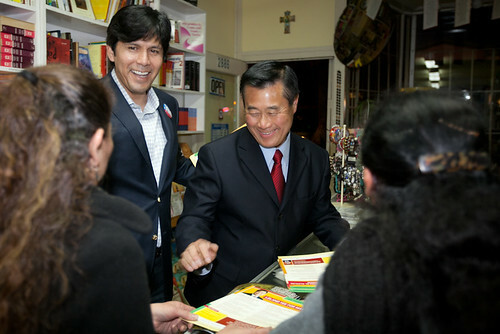 He was assisted in the Spanish-speaking neighborhood by Senator Kevin de Leon, (center right), of Los Angeles. Photo by Elijah Nouvelage. Senator and SF Mayoral candidate Leland Yee (center) campaigns in the Mission district of San Francisco on November 8, 2011. He was assisted in the Spanish-speaking neighborhood by Senator Kevin de Leon, left, of Los Angeles. Photo by Elijah Nouvelage. A John Avalos supporter tucks her baby in using a John Avalos shirt outside the 24th and Mission BART Station on November 8, 2011. Photo by Elijah Nouvelage. 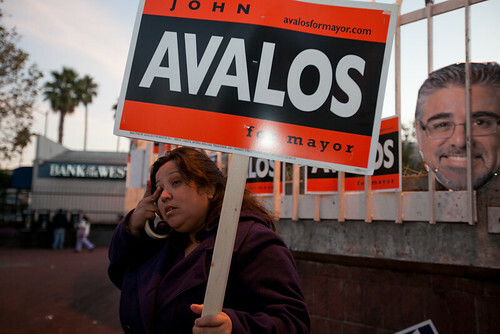 A John Avalos supporter campaigns for her candidate outside the 24th and Mission BART Station on November 8, 2011. Photo by Elijah Nouvelage. 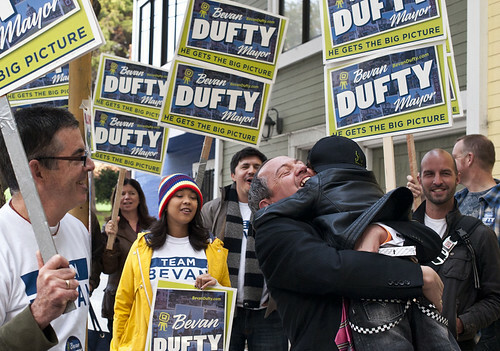 San Francisco Mayoral Candidate Bevan Dufty, is hugged by his daughter Sidney, after voting in the 2011 San Francisco elections, Nov. 8, 2011. Photo by Samantha Battles / Special to Xpress. San Francisco Mayoral Candidate Bevan Dufty and his daughter Sidney are interviewed after voting in the 2011 San Francisco elections, Nov. 8, 2011. Photo by Samantha Battles / Special to Xpress. San Francisco Mayoral Candidate Bevan Dufty, with help from his daughter Sidney, submits his filled ballot at a polling place on election day, Nov. 8, 2011. Photo by Samantha Battles / Special to Xpress. 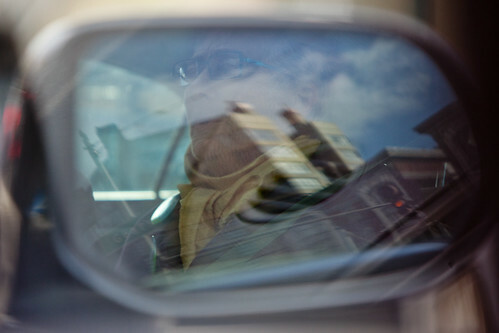 Terry Baum (Left) San Francisco Mayor Candidate for the Green Party, looks out of a car while moving to a different place of the city to continue her campaing work, Sunday, Nov. 6, 2011. Terry Joan Baum is a playwright, director and actress, moved to San Francisco in 1977 and joined the Green Party in 2003. Photo By Monica Quesada / Special to Xpress. 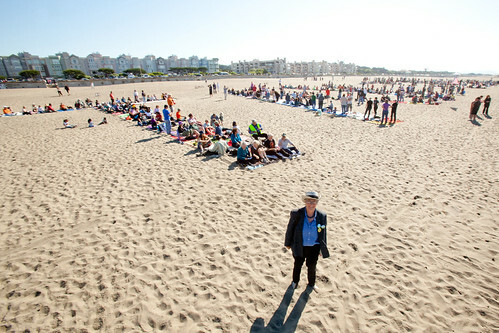 Terry Baum (front) San Francisco Mayor Candidate for the Green Party, posses for a photo in front of the "Tax the 1%" human banner at Ocean Beach, Saturday, Oct. 29, 2011. Terry Joan Baum is a playwright, director and actress, moved to San Francisco in 1977 and joined the Green Party in 2003. Photo By Monica Quesada / Special to Xpress. 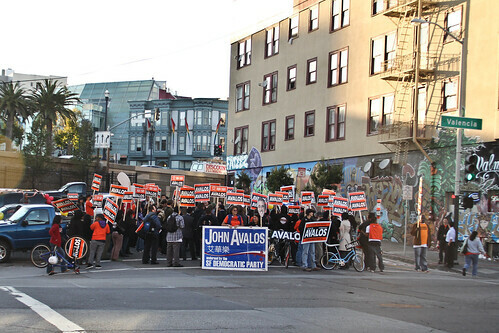 John Avalos, San Francisco mayoral candidate, addresses a crowd of supporters at a rally on McCoppin and Valencia streets a day before elections on Nov. 7, 2011. Photo by Andrew Lopez. 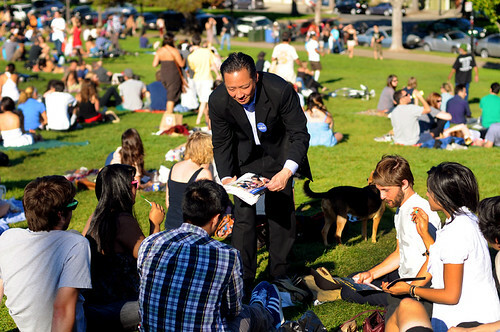 Jeff Adachi, San Francisco mayoral candidate, reaches out to possible voters at Dolores Park in San Francisco, Calif., Nov. 1, 2011. Photo by Adam Moreno. / Special to Xpress.